Casa del Sol is the antithesis of the majority party hostels that make up Medellín's Zona Rosa. Spanish is the preferred language and the house provides many opportunities to practice. Needless to say, the vibe is more laid back and the travelers staying here are semi-permanent residents rather than passing through to the next fiesta. The other day two Argentines came by, meaning that we had to drink some Maté and shoot the breeze. On our way to buy tickets for Medellín's fútbol "Classico" (traditional rivalry), we decided to take a detour towards the barrio of Santo Domingo. 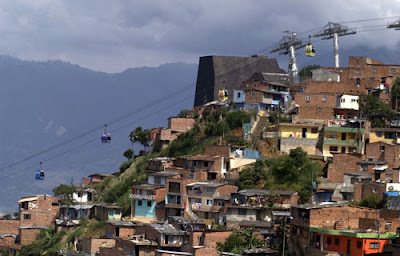 I've already showered Medellín's MetroRail with tons of compliments, but here's a few more: in addition to the many convenient stops throughout the city, For the price of 1500 pesos (75 cents), you are also entitled to a Gondola Ride. The super modern MetroCable system was introduced as part of Medellín's MetroRail in 2006. There are several more MetroCables to various areas around the city and more under construction. The logic behind building these was geared towards developing the lower-income neighborhoods that line the highest reaches of outer Medellín. From the example of Santo Domingo, it looks like things are really rolling. Once inaccessible to tourists, the twisting cobbled streets remind of a small town Italy or Spain. We got a fantastic a lunch for only 5,000 pesos then headed down to the black obelisk that is the barrio's library/community/daycare center. These architectural peculiarities have been popping up all over the city, giving Medellín a very furturistic and developed feel. (No surprise the current mayor is an architect). Ah but walking with Argentines was fun, because every time anyone shouted "gringos," I could shake my head and yell back "argentinos!" Ah but alas, we were the true boludos, as none of us remembered to bring a camera. And with that I'll leave you with some amazing images that show how many cool buildings like this exist in Medellín.